If you’ve decided you hate the precision of 3d printing and you want a shaky, hand drawn mess of plastic filament instead, the 3Doodler is for you. 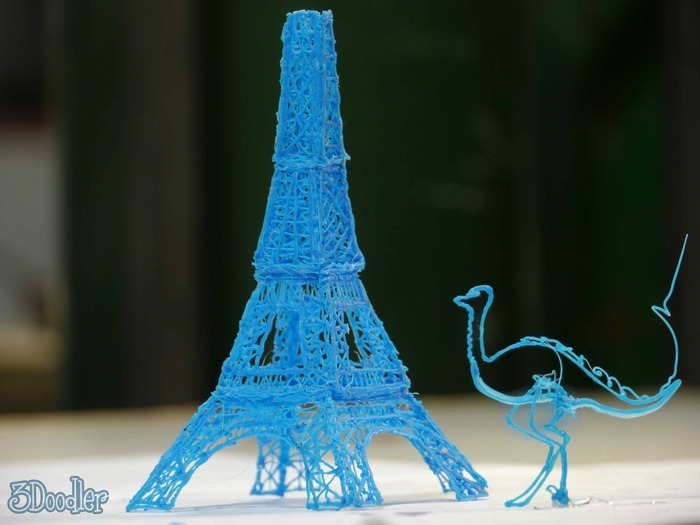 The 3Doodler is a bare extruder ripped from the typical 3d printer control system. It feeds in filament and extrudes at a constant rate, which then can be used to draw freehand. We saw a version of this concept back in November, with the MakiBox Scribble. The Scribble also used a freehand 3d printer extruder as a pen. However, the Scribble was just a demo toy instead of a full-blown product. The 3Doodler is a much more developed design, with indicator lights telling you when the extruder head is warm, and buttons that start and stop extrusion at different speeds. This is not 3d printing, but the product uses technology from 3d printing. The pictured demos use standard extruders and drive motors to draw in ABS or PLA. It might be fun as an art toy – picture Picasso’s light paintings. It can also be used as a glue to paste smaller 3d prints together or fix small flaws the same way ABS slurry is sometimes used. The early comer Kickstarter rewards at $50 are all taken, but you can still get a preorder for October in for $75.